← Pier Fire Update, 7:45 am, 9/6/17: 20% Contained. Pier Fire Update, 8pm, 9/6/17: 25% Containment. Fire Summary: It was a productive day on the northwestern side of the fire south of Bear Creek Road where crews mopped up firelines. Near Wishon, on the fire’s north side, firefighters continued to improve direct fireline along the Fox Farm Road (FR 20S03). The fire west of Sequoia Crest was held and is not significantly active. Crews continue to patrol dozer lines and firelines between Sequoia Crest and Alpine Village, immediately extinguishing hot spots as they find them. The operational priority for crews today was the fire’s east side which was the most active area of the fire from Alpine Village to Rogers Camp. Efforts to complete the dozer line were hampered by increased fire behavior. Fire managers are planning a safer location to establish as contingency lines, then fire out unburned fuel between it and the main fire when conditions allow. Air tankers were utilized today to cool the edge, but it was still to hot to place personnel on the ground in this decadent brush. In the Tule River Indian Reservation firefighters used existing roads as contingency lines to limit the fire’s spread southward. On the southwest side of the fire, ground crews began conducting firing operations in the grass and oak woodlands east of Springville. They ignited vegetation using drip torches and aerial ignition (http://bit.ly/2f3giXd). Residents will continue to observe flames and smoke looking up at Black Mountain as a result until the main fire is tied into contingency lines. The firing operation is being done in such a way to limit fire intensity, a strategy that was well planned over the past few days. Voluntary: Springville, Residences along Balch Park Road (County J37) north of Highway 190 to Bear Creek Road, Bear Creek Road (County 220) east of Balch Park Road, SCICON, Mountain Home Conservation Camp. Evacuation Center: Porterville College Student Center, 100 E. College Ave., Porterville. Call 661-324-6427 (weekdays) or 800-REDCROSS (1-800-733-2767) Provide food, shelter, arrange for animal care, and other basic needs for evacuees. Closed to all traffic: Highway 190, east of Springville where it intersects with Balch Park Road. Western Divide Highway/HWY 190, west of Ponderosa, west of and including the North Road (FR 21S50). Open only to residents (with proof of residency) Balch Park Road from the intersection of HWY 190 to Yokohl Valley Road. 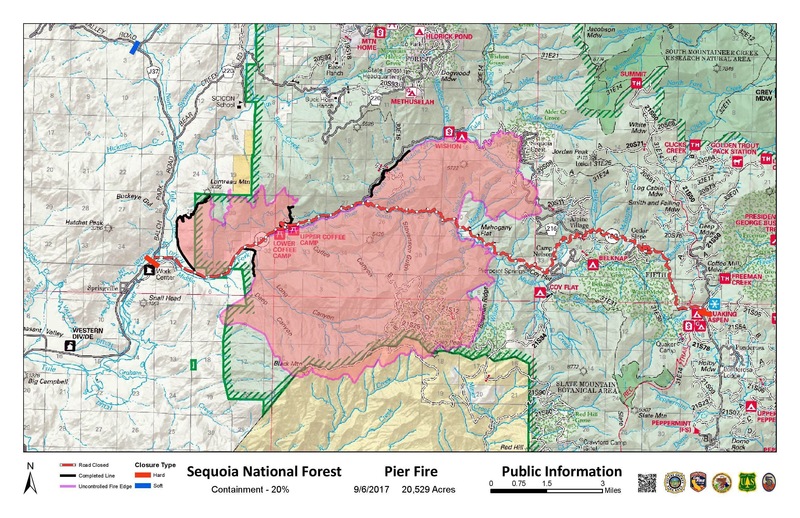 Area Closures: Sequoia National Forest closure includes trails, roads, and lands around the Pier Fire: Closure Order No. 0513-17-34 https://inciweb.nwcg.gov/incident/article/5548/39662/ CAL FIRE has closed Mountain Home State Forest, and Tulare County has closed Balch Park. All areas are closed until the fire is brought under control. Please keep in mind, suppression repair work will take additional time after the fire is contained, recreationists should plan ahead.